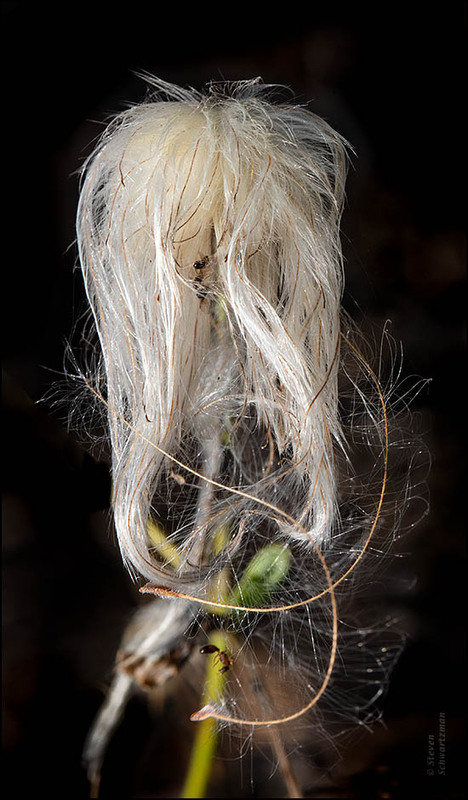 I love Clematis every season – lovely shots. What kind(s) of Clematis do you have in Sweden? Clematis vitalba grows in the wild, but then we have hundreds of different clematis in our gardens. Great variety. I love the alpine kind with only small “bells”. I love learning new things – about plants too of course. I am glad I could get you something new! Yes, we all need to get new ideas planted in our minds from time to time. And that is one good reason for blogging! Agreed. And for reading in general. The macro is the picture that was new for me, even though I’ve taken plenty of macro photographs of this species over the last two decades. Oh my gosh! The bottom one looks like my hair in 1967. The top ones look like it now. How funny! very interesting. Here in Va not so much so. These just show that there is beauty in many stages of a plant’s life. And aren’t you the funny one! I’d thought about mentioning that the Clematis in the second picture looks to me like a wig, but then I decided to say nothing and see if anyone else got the same impression. Maybe you can take a photograph of your face from 1967 and use Photoshop or another program to blend it with the close-up of the Clematis. 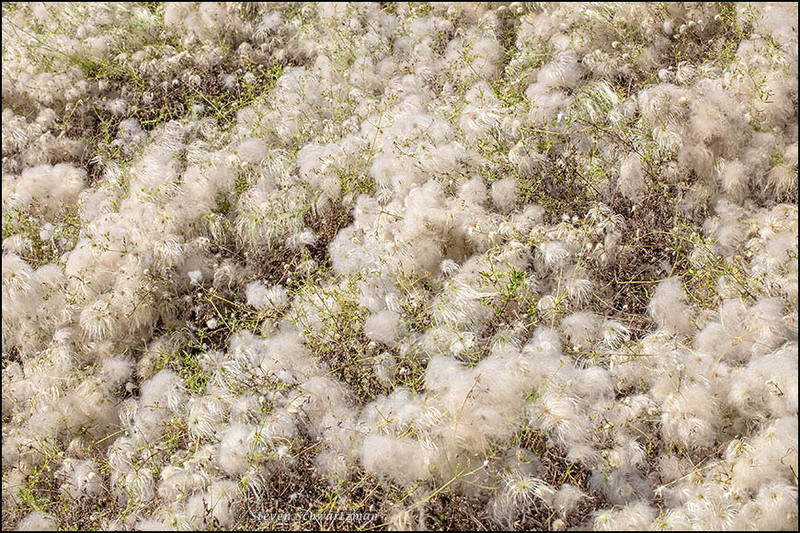 In Austin, Clematis drummondii gets to be much fluffier than the other two native species, and it’s also by far the most common of the three. That means we get to see lots of these “beards” in the second half of each year. I know of two stands in my neighborhood, each about half a mile from home. It’s good to hear you got to see some of that puffiness in Utah. I wish the grandeur of Utah were half a mile from home, too. Old man’s beard is a great name, but I agree it looks more like a wig to me. The dead ants are puzzling. The first picture, which shows a much more common sight than the second, backs up the beard metaphor. You can understand why, as a photographer who’s long had a mostly white beard, I’m partial to the common name. In contrast, I’ve never worn a wig. As for the dead insects, I’ve wondered whether chemical spraying could account for that. We’ll probably never know. The first one, I glanced at my phone, and thought, oh, Steve’s visiting Yorkshire, and they’re bringing in the sheep for shearing. The second one is also great – and like Dianne, I also thought of hairstyles – – having trouble choosing between Ozzie Osbourne, early Rod Stewart, or Bon Jovi on a humid day. The ants appear to be dead? I’m glad you like the double whammy. I can see why you’d think of sheep in the first instance; in spite of that, the metaphor has never occurred to me over the two decades I’ve been photographing this species. Call me slow. My initial take on the second picture was a wig rather than the actual hair on the head of a person. Yes, the little insects were dead, cause of death unknown. I wondered whether any chemical spraying had gone on nearby, given that the plant was right at the edge of the street. Leya, in her second comment, above, also mentioned Clematis vitalba, and I replied to her comment with more information that I’d learned about that species. Your statement about its flowers having a slight almond smell is the first I’ve heard about that. I don’t think I’ve ever noticed a scent from the flowers of Clematis drummondii, but I’ll try to remember to sniff some to find out. I’m glad you find the macro a beauty, even if Rod Stewart isn’t usually considered one. It looks like our native chaparral clematis. Some people like the fluffy seeds more than the flowers. The flowers are supposedly not very impressive, and do not last long. I think I prefer the bloom, even if sporadic. The seeds are interesting, but can look grungy as they deteriorate and fall all over everything else if they get damp from the drizzly fog that moves in at about the same time of year. I saw them back in about 1989 looking really fuzzy and weird enough that I was compelled to go over and confirm that they were clematis. That was cool! Clematis drumondii is actually sometimes available here in nurseries, while our native chaparral clematis is not. I wouldn’t have guessed our local species is available in nurseries in California. My impression is that gardeners here, except maybe for some native plant folks, would consider Clematis drummondii undesirable, almost a weed. Maybe I’m wrong. You would not expect Yucca glauca to be available here either, but some of us really dig it. Some of my favorite yuccas are from Texas! The Clematis drummondii that is available in nurseries might be a garden variety of the species. I really do not know because I never considered procuring one. It might have been marketed as a native for a while. There are quite a few odd plants that can be found as natives here. And just because a nursery says something is native doesn’t mean it is. An Austin nursery some years back advertised a “native Vitex.” I called up the company and pointed out that Vitex comes from other parts of the world. No Vitex is native here. ‘Native’ sells. Even plants that really are native to California are not necessarily native here. California fan palm (which is my favorite palm) is native to Palm Springs, but really dislikes the coastal climate in Santa Cruz. California, like Texas, is such a big and diverse place, that the Torrey pines that are native to San Diego County are about as native to Modoc County (In the northeastern corner of California) as the palmettos that live on the coast of the Gulf of Mexico are to Kansas City. Right you are. Big states like California and Texas are countries unto themselves. Coastal Texas is another world compared to west Texas. These vines have a lot to offer in all their stages. Nice Steve! I always learn something from your blog! Learning is fun. I don’t care about games, but give me a good book to read and I’m happy. It’s Cousin It! Without his sunglasses! I had to look that up. It’s It’s likeness, all right. I have mentioned before how we feel about our version of Old Man’s Beard in New Zealand. We are still trying to find a way to deal with it. https://www.stuff.co.nz/business/farming/105582164/pest-busters-aim-to-trim-old-mans-beard-with-insect As for the ants, dead in the wig, I can only say that death by hair on a chinnie chin chin is a cruel way to go. It’s one of so many non-native plants we saw in New Zealand. I’m sorry to hear how well-established it’s become there and that your country has spent millions trying to get rid of it. I can assure you I didn’t huff and puff and blow the old man’s beard in. I don’t see sheep in your second photo, but a sheep dog, with its little black nose poking out from the depths. I do love this plant, and have missed seeing it this year, although I have seen the developing seeds and fluff from Clematis pitcheri. The first photo reminds me of the froth that develops atop a pot of fresh lady creme peas when they first begin to cook. I’m familiar with froth from cooking beans in general. There are so many native species in any area that it’s almost inevitable we’ll miss some of them in any given year, especially if trips intervene. This year I prominently missed bluebells and basket-flowers. It resembles cotton, Steve. I wonder if anybody ever tried to spin it? Good question. I searched a little but didn’t turn up anything except some fabrics with images of clematis printed on them. The strands turn feathery, and I wonder if that might impede an attempt to spin them. i’m at a ‘cyber’ and it’s loud – i’ll save this ont he screen to read the comments at home! Happy home-reading to you, in peace and quiet. I feel fortunate to have this Clematis growing in lots of places around Austin. It’s a hardy native (but not related to Thomas Hardy’s Return of the Native). If only I could have a head of hair like that. I’d suggest rubbing some of these plants’ sap on your scalp except that the sap of the European Clematis vitalba is known to irritate people’s skin and even cause sores. I would be willing to try almost anything. Just kidding. I’m happy to have lived long enough to be a balding old man. As long as you’re content.